Icebox cookies, also known as "refrigerator cookies," used to seem like an old-fashioned treat to me. I mainly came across them in retro/nostalgia baking books, and ignored them since they looked plain and kind of boring. However, a number of years back I discovered that baker/designers like Eugenie from Eugenie Kitchen and Yuka Ito are updating this classic cookie and elevating it to an art form. Because of the unique method of preparation the dough must undergo in order to be sliced into individual cookies and baked, you can introduce patterns of color to play with the cookie design that is revealed when you slice. I started experimenting with the slice-'n'-bake style of cookie years ago, trying to wrap my mind around the way you have to re-think shapes when planning a design. You have to imagine how to stretch each shape into an extended log version of itself and layer the logs together before slicing into coins to reveal the layered pattern. Eventually, lacking the patience of a Eugenie or a Yuka, I decided that creating simple slice-'n'-bake designs and finishing them with piping was the way to go. It is more efficient and achievable for us mortals, and on top of that you get the added texture and dimension of the royal icing on top of the cookie. 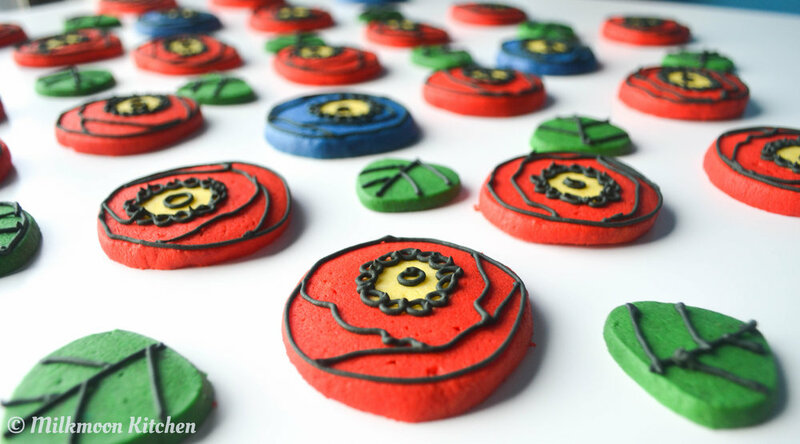 For this poppy design I tried to take one of the simplest possible icebox layering techniques, wrapping a small log in another color to make a cookie with a circle in the middle, and make it exciting with easy piping, and I must say I am happy with the results. This is an example of the benefits of prioritizing impactful design over complexity of technique; these didn't take much time but were more stunning than the complicated designs I've pulled off in the past. I did not make perfectly circular yellow centers and wrap them in perfectly even dough—I kept things relaxed knowing that my design would benefit from a lack of uniformity. The recipe for these icebox cookies is pretty simple. You're basically dumping ingredients together, mixing, and coloring, et voilà, the dough is ready to shape. You'll notice there are no leavening agents listed below, because leavening can cause patterned cookies to distort in the oven. But, lucky for your waistline, the high ratio of butter to everything else in this dough keeps the cookies nice and tender! You're welcome. Sift the powdered sugar into the bowl of your mixer and add the butter. Using the paddle attachment, mix on low until the powdered sugar is incorporated. Cover with a damp towel to avoid any airborne-sugar-related coughing fits. Add the egg, vanilla, and salt and raise the mixer speed to medium until combined. Scrape down the sides of the bowl and mix at medium again, for a minute and a half at most; no need to beat because we are specifically trying to avoid adding leavening to these cookies, including air, so that when they bake they stay roughly the same shape. Reduce the mixer speed to low and add in your flour all at once, allowing it to incorporate slowly. As soon as the dough looks uniform, stop the mixer and scrape the bottom of the bowl. Mix again if there's any loose flour left, then turn the dough out onto a piece of waxed paper. Reserve 150g (1/2 cup) dough for the yellow centers, and 75g (1/4 cup) dough for the little green leaves, if you're making those (totally optional), and divide the rest of the dough into two pieces for the red and blue doughs. Add one of the two larger pieces back to the mixer and add a solid glob of red gel color, a heaping teaspoon. Beat it into the dough on medium, see if you like the color, and add more as necessary. I used... quite... a lot of food coloring for these cookies, and had a blue mouth for the entire day. Worth it! But absolutely use less if you don't mind a softer color or are trying to watch your intake of pretty chemicals. Wash your mixing bowl and paddle attachment and repeat the coloring process for the second large piece of dough, adding the blue coloring this time. Add just a half teaspoon of yellow to the 150g (1/2 cup) piece and adjust from there since it will require less coloring. For the green dough you can add about a teaspoon of color. Pro coloring tips: I added a toothpick tip's worth of red coloring to my green dough to temper its neon brightness. I used ChefMaster liquid and gel colors, and would specifically recommend their Non-Taste Tulip Red liquid color for those who are also very sensitive to that horrible burny chemical taste that most red coloring has. Divide your yellow dough in two and roll each half out until they measure about 3"-3.5" around. You’ll notice that one log is longer than the other, pictured above. This was due to carelessness, so I encourage you to do better. That said, it didn't really end up mattering much. This design is so forgiving! Put the yellow logs in the freezer to firm up. This may be the most important step, because a convincingly round yellow center will make the cookies look much more polished even if the petal portions aren’t perfectly straight all the way around. Like mine. Start working on the red poppy dough. Lay down a sheet of waxed paper. For the yellow log I used with my red dough, I measured its length at 13 inches and the circumference at 3.5", so I pressed my red rectangle out to about 13”x4.5”, which gave it a height of about 3/4”. Place the yellow log at one end of the dough, pressing down just a bit to anchor it. 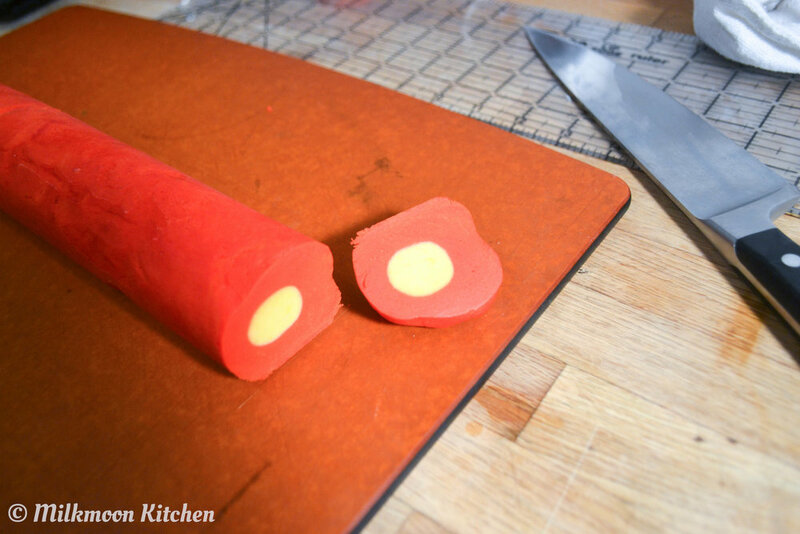 Using the waxed paper to protect the dough from your hands, pull up on the side where the yellow log sits and roll it towards the other side of the red dough, allowing the red to stick to the yellow as you roll it over. Pull both sides of the waxed paper up around the new mega-log and rub your hands over the waxed paper on the sides and top to smooth. Don't worry if the red dough doesn't meet perfectly at the top, just use your hands to smooth red dough over the yellow peeking out until it's totally covered. If the red dough doesn’t want to stick to the yellow, just pinch it up against the yellow to remove any air bubbles and keep rolling it to adhere. Pull the waxed paper away. A little red dough may stick, and that is totally fine. Roll the cookie dough log back and forth to smooth it and get it as round as possible, then wrap it up in another piece of waxed paper and give it some time in the fridge, at least two hours but up to a day or two if you wrap the waxed papered log in additional plastic. If you're taking things to the next finicky level, you made some green dough as well. 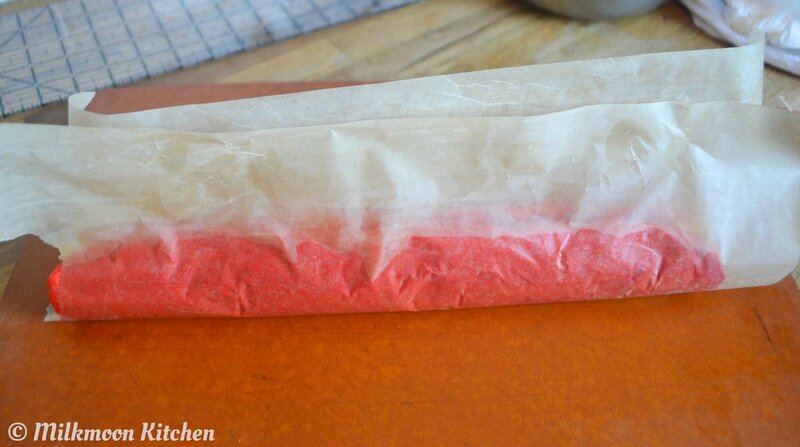 Roll it into a log that measures about 4" around and then wrap it in waxed paper. Hold the log and rub it back and forth over your countertop so that you start to flatten the bottom. Rotate and repeat until you have three flattened surfaces; if you were to slice the cookies now, they would look like little triangles. Pinch along the top of one of the points you've made along the length of the dough, and rub that crease to smooth it out. This will be the pointy tip of the leaf when you slice these cookies after refrigerating for two hours. Once chilled through, the logs are ready to be sliced! Preheat your oven to 375°F (190°C). Now prepare yourself! The reveal is a particularly exciting moment, even for cookies as simple as these. You'll want to slice each at a thickness of about 1/4" and place them on a sheet pan giving them at least an inch and a half of space all the way around. Bake for 8-10 mins, checking the first batch frequently. You do not want the colors to brown and ruin your hard work! Finally, it's time to pipe. I used royal icing colored with black ChefMaster gel color. The tip I used was an Ateco 00, with a tiny round opening so I could get some fine lines going. The design is simple; small circles of black ring the yellow center, with a slightly larger one in the middle. A black line goes around the outside of the cookie to give the shape more definition, and then I piped abstract petals in a pattern that is a bit hard to describe. Choose a cookie and copy it, and then you'll start to get the hang of it; it's all very forgiving. The icing dries overnight, and then you're ready to go! Enjoy!